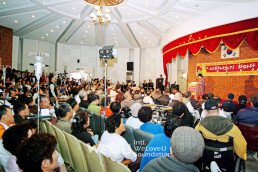 In the warm afternoon of November 18, when early coldness receded for a while, the final rehearsal was completed at 2 p.m., before the consolatory performance for the veterans started at the grand hall of the Veterans Hospital in Seoul.This performance was designed by the New Life Welfare Foundation for the veterans and wounded soldiers and police officers including their families. In the past June, Chairwoman Zahng Gil-jah visited this hospital to comfort them and planed this performance to help them more. The patients and their families gathered at the grand hall by twos and threes before the performance began and filled the seats to the full. 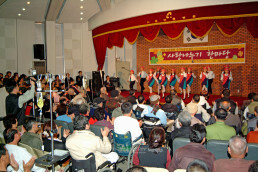 Including the hospital staff taking care of the patients, about 400 audience watched the performance. Some people watched the performance standing at the entrance open for the warm weather. Among the patients, there were many who were equipped with medical instrument or crutches, wheelchair and ringer solution on their arms. A patient on his sickbed came by the help of family, but had to go back because of the lack of space. Even though all looked excited with a diversion in a long time, we could see at a glance how great their pains were. Soon the New Life Children Choir and various performances, including classic and popular songs, were staged. The patients in their old ages and their families sang together, following the songs with hand wave. They even shouted for encore. The senior comedian Bae Sam-yong in his eighties, whom the New Life Welfare Foundation invited, performed the “silly acting” together with another senior comedian Song Hae. They received a big round of applause from the wounded warriors by reminding them of their old memories. The children’s Samulnori (traditional percussion quartet) and traditional dance also received a big round of applause from the audience. To each of the patients returning to their sick rooms, Chairwoman gave a gift and wished for their health. The bright faces of the patients with remaining laughter were a great gift to the members of the New Life Welfare Foundation. The veterans strived for the country, but have been burdened with pain and disability their whole lives. Without their sacrifice, we would not be as we are now. What they need the most is the support from the country as well as concern and consolation from people. We appreciate the sacrifice of the veterans and wish them health.